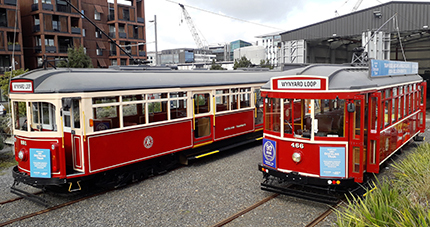 The Halsey Street Stop with Auckland Dockline Tram will keep you busy. Wander the plaza, plan your next adventure, see an exhibition or simply gaze at the view. Auckland’s newest events centre is a world class exhibition and events space right on the waterfront. Check out the fantastic views from the public viewing platform. An attractive, open public space, this gateway to Wynyard Quarter features the Container Wayfinding Kiosk. The Kiosk is the central hub of the area where visitors can find out about attractions, tours, dining and future developments in the area through the use of interactive displays. Take the bridge to Te Wero Island and the heart of the Viaduct Harbour, only minutes’ walk to the Voyager Maritime Museum, Cruise ship terminal, Ferry Building, and Britomart Transport Centre. The site of ASB Bank’s state-of-the-art offices.